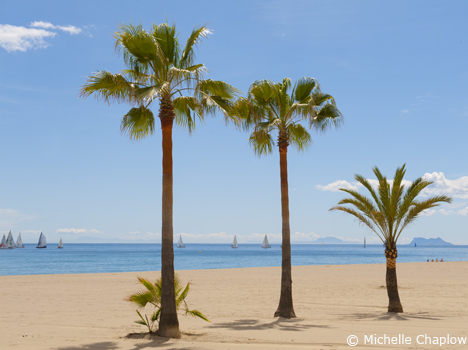 The beaches of Estepona, with picture postcard views across the Mediterranean to Africa. Estepona Beaches (West to East). This 2km beach is bounded at the west by the Torre de la Sal headland and runs to the next headland at Bahia Dorada; it is about 40m wide. Not overly busy, this is mainly used by the residents of the urbanizations that straddle of the coast road. There is a chiringuito at the western end near Torre del Sal. There is a pedestrian promenade for part of this long beach and little dedicated car access except roads in the urbanizations. About halfway along is a large rock called Piedra Paloma (Dove's Rock) just out to sea. This marks Playa Piedra Paloma, which is actually in the municipal district of Casares and in 2016 became an authorised Dog Beach replacing the Playa del Sal dog beach. Access to Playa Piedra Paloma is via the Urbanizacion Casares del Mar. This beach is to the east of the Bahia Dorada headland, and where the Arroyo Vaquero river reaches the sea. The car access is a roundabout into the Fuerte Estepona Suites Hotel which fronts this beach Upon entering the turn right and wind your way through the houses near the Arroyo Vaquero river. 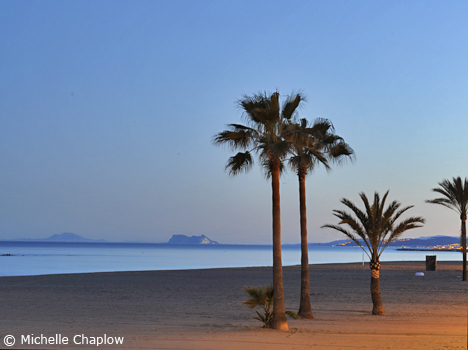 The beach is about 1km long and 50m wide and is quiet, with ample parking space and a chiringuito. Access is also provided on the other or west side of the Fuerte Hotel. This is the name given to various stretches of beach in the area of the river Guadalabon. Some areas, such as that in front of Gran Hotel Elba (with promenade walkway), or in front of H10 Estepona Palace Hotel, are wider, but much of the rest of this 2km seafront is not overly interesting. Situated just outside the town of Estepona, to the west of the Marina, El Cristo beach is situated in a delightful sheltered cove, ideal for children, with two chiringuitos. Its ideal location means longer hours of sunshine, making it a particular favourite with serious sunbathers. This beach has become increasingly popular in recent years and tends to get quite crowded on summer weekends. It has a good atmosphere with music playing at two of the beach bars. The cove and the outer protection wall ensure the sea is warmer than the surrounding waters. It slopes very gently and is very safe for children. There is a lifeguard station and showers in the summer. There are two good beach bars, the trendy Havana Beach and the moore traditional Chiringuito Lolailo. 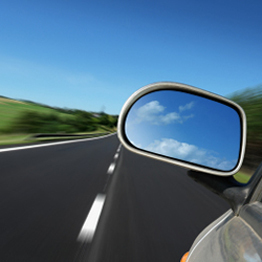 Car access is by a narrow, steep road from a roundabout to the west of Estepona marina or town. Summer parking at the back of the beach is chaotic, so it's best to continue a little further to the open ground, where is always ample parking and some wild camping. The car exit route is in this direction via Estepona Marina. Its high standards of cleanliness and excellent facilities have been recognised by the European Blue Flag award. Below is a video of the beach from our YouTube channel. 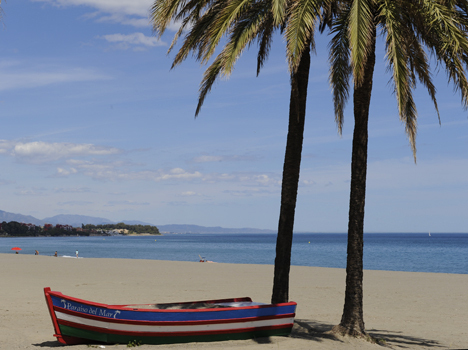 Right in the centre of Estepona is the town's most popular beach, La Rada. It is long and backed by a modern seafront promenade for the entire length (2.6km). Chiringuitos (beach bars), are located all along the seafront and serve traditional seaside fare, such as paella and fresh sardines, as well as a choice of international-style dishes. The Marina and lighthouse are located at the west end of La Rada beach. The entire length of beach runs parallel to the ‘old coast road'. There are two large underground car parks here; otherwise parking can be found in the town. Disabled access is better here than at other nearby beaches. The seafront prom and the beach terminate at the eastern end with a headland known as Punta de la Plata. A 4km stretch of narrow low-quality beach, stretching from the Punta del Plata headland which terminates La Rada beach the west to El Padron Beach to the East. 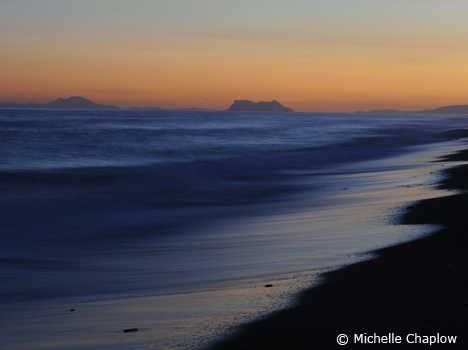 This is another name for the beach slightly to the east of Punta del Plata. A narrow quiet sand and pebble beach. The popular beach located just to the east of the Rio Padron, near the Kempinski Resort Hotel. The beach has a large car park and two beach bars, making it particularly popular in the summer. Laguna Village is located here, a small upmarket Balinese-style shopping centre with fashion and decoration shops, open 11.00 to 20.00. A selection of restaurants includes Terra Sana, Camuri Grill, Carmen (traditional Spanish) with small roof terrace, La Pappardella (Italian), restaurants are open 10.00 to 24.00. Also here is Puro Beach restaurant and beach club with large swimming pool, white sun loungers and fusion music DJ. Car Parking. Km 159. The El Padron beach's high standards of cleanliness and facilities are often recognised by the European Blue Flag award. Named after the river that flow to the sea where the beach is located. This 2km stretch of narrow, quiet beach is hidden behind a series of older properties and urbanizations. Try the chiringuito at Punta del Castor just to the east of Rio Castor at km 160.5. A track leads down to the beach past the allotments. Named after the river that flow to the sea where the beach is located. Here is Chiringuito Torre del Velerin near the old watchtower of the same name. ‘Environmentally funky' Tarifa-style chiringuito (chill-out area, salads and smoothies, DJs, clothes store) Sonora Beach is near Urbanization Hacienda Beach at km 162; alternatively, you can park at Urb Los Granados Playa, after the Selwo turn off near Rio Velerin. Quieter, narrow, rocky beaches: Playa Bella is next door to the upmarket beachfront of Health House Las Dunas and the TikiTano restaurant and lounge, with preserved old watchtower and ruins in a large, beachfront area with lawn and seafron promenade. West of Rio Guadalmansa is Playa Guadalmansa with the offen missed Playabella Spa Gran Hotel. East of Rio Guadalmansa, there is a popular and amusingly named Chiringuito Heaven with nearby Kite and other water sport school facilites. Unremarkable semi-urban, narrow beaches in this part of Estepona, near El Saladillo and Costalita and other urbanisations. This beach is nominally 3km long, but is broken into many stretches with a few beach bars. Access is by the roads through the urbanisations. Torre de Saladillo is an old watch tower 'hidden' here. Unremarkable semi-urban, narrow beaches in this part of Estepona. Nominally 2km long, this beach is broken into many stretches. Atalaya Park Golf Hotel and Resort is located on the headland to the west of this beach. To the east of the headland is Rio Guadalmina, which is the municipal boundary of Estepona with Marbella. The Playa del Cristo at sunset.